In recent years, metal roofs have become highly popular in Atlanta and across the U.S. not only in residential applications, but commercial applications as well. While our roofing contractors repair and install all types of roofs, there are several advantages to having a metal roof. Considering the roof protects your structure’s integrity and everything beneath it, it’s important to make a wise decision. Why consider metal roofing for commercial businesses? They’re practically maintenance-free, considering this type of roof is highly resistant to mildew, insects, wind, fire, and the rot you may experience with other types of roofing. For businesses concerned about environmental impact, metal roofs are a good choice, as they are recyclable. Regardless of the climate in your region or your structure’s architectural design, a metal roof integrates easily in regards to style and allows for substantial energy savings. Superior wind resistance, important in areas such as Atlanta, where spring and summer storms and/or tornadoes can produce devastating winds. When treated with a reflective coating, this type of roofing system can help you save as much as 30% on energy costs. As mentioned above, metal roofs are resistant to fire, mildew, rot and insects, so your roof will have a substantially longer lifespan, which means savings on replacement costs. 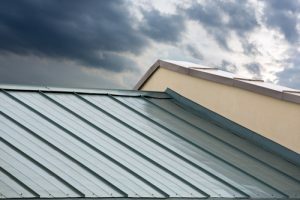 Whether for a steeper sloped roof on an office building, low sloped, or even flat roofs often used in industrial applications, metal roofs provide many benefits and are extremely durable and heat resistant, standing up to all types of weather conditions and resisting the damage often caused by water or moisture. From flat, tile, and rock roofs to new installation and leak, deck, and hail damage repairs, Kelco Roofing has long been a leader in the Atlanta commercial roofing industry. For more information about the advantages of metal roofing, or maintenance and industrial roofing repairs/installation, trust Kelco for unparalleled quality, products, and service.